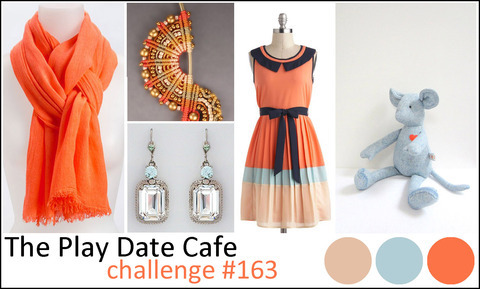 It's time for a new color challenge at The Play Date Cafe. This week our colors are Champagne, Baby Blue and Tangerine. 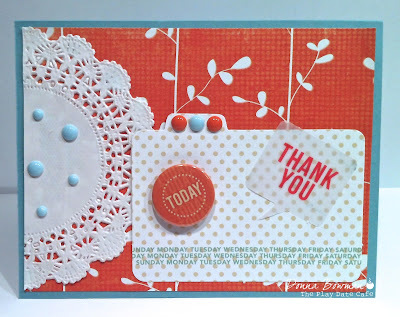 I used various items from one of my Studio Calico monthly kits to make this card. One lucky person will win a prize from The Play Date Cafe prize vault! So be sure to link up to our challenge. I can't wait to see what you create. Uber cute Donna!! Those dots are gorgeous! Are they those new 'enamel' thingys... cause I think that I *need* some lol! OHHHH! So pretty! I LOVE this color combo!! And I LOVE your use of brads!! FAB! Pretty indeed! Love the enamel dots and the various elements. The bg is stunning!